Qataris share many characteristics with the region as a whole, but stand apart with several traits and preferences. 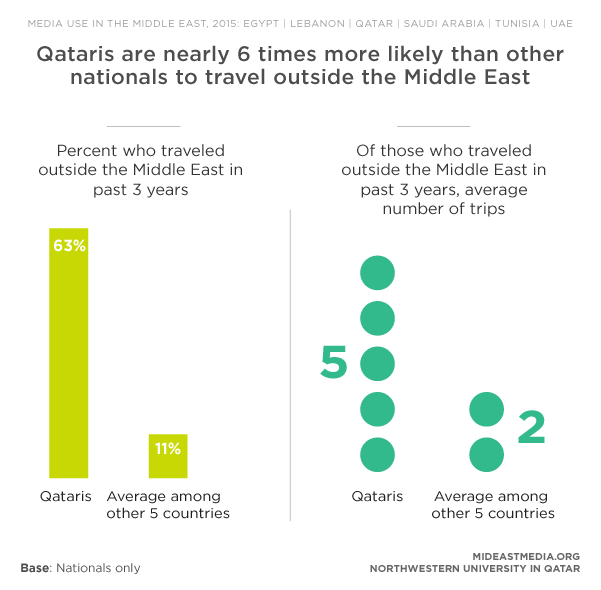 Notably, Qataris travel outside the Middle East nearly six times more often than other nationals in the region (63% vs. 11% have traveled outside the region in past three years). 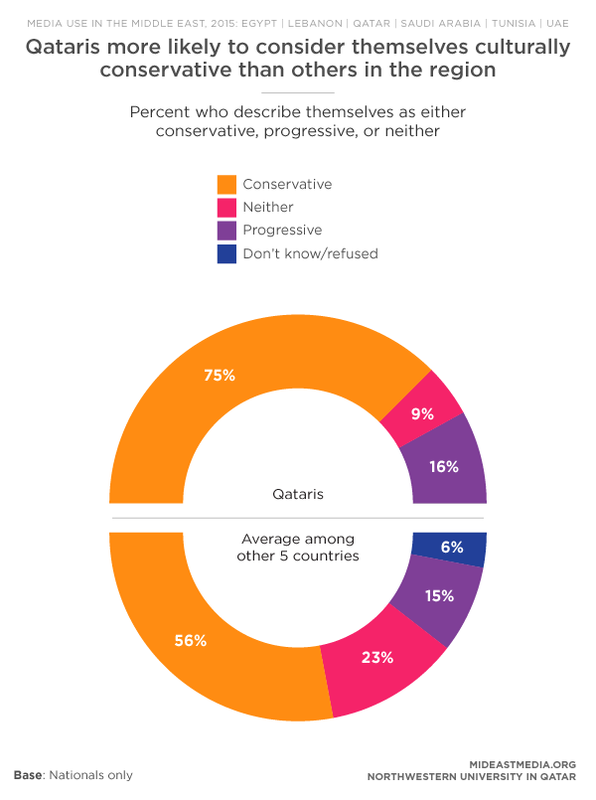 Despite the perception that global travel is associated with more progressive attitudes, Qataris are likely to identify themselves as more culturally conservative than other Arab nationals (75% vs. 56%). Qataris show strong interest in religious/spiritual information, especially online content, compared to other nationals in the region. Over half of Qataris say they access religious/spiritual sites daily (54% vs. 22% of others), as well as look for religious information online daily (57% vs. 28% of others). More than half (56%) also watch religious/spiritual content on TV, similar to other nationals, but Qataris are more likely to watch religious videos online (53% vs. 28%). Additionally, three in four Qataris express interest in religious and spiritual news (77%) compared to 55% of other nationals. Both men and women express interest in religious and spiritual news equally, but female Qataris watch more religious and spiritual videos on television (66% vs. 46%) and online (65% vs. 42%) than males. Qataris spend more time online than other Arab nationals (32 hours per week vs. 25 hours). This includes more time online socializing with family (11 hours vs. 7 hours) and colleagues (9 hours vs. 5 hours). Similar to those in other countries, Qataris are not passive online consumers. Most use the internet daily to post messages/comments via social media, post their own multimedia content, repost or share links, and check email. Qataris are much more likely than other nationals in the region to access religious/spiritual sites daily (54% vs. 22%), seek health information (55% vs. 27%), and read/watch religious information (57% vs.28%). Furthermore, Qataris report increases in most online activities since 2013, including downloading videos and listening to online radio. Qataris consume comedy and news/documentary internet content most often, which differs from nationals in all other countries; in the UAE, social satire tops the list, and in Saudi Arabia comedy is the top choice. Enigmatically, Qataris are among the most likely in the region to watch news online, but are least likely to share news content online (35% vs. 62% of other nationals in the region). Qataris send a greater proportion of their direct messages to groups as opposed to individuals, than nationals in other countries (47% vs. 30%). Fewer Qataris use Facebook than other nationalities in the study (47% vs. 86%). Also, more Qataris use Snapchat (34% vs 4%) and Instagram (62% vs 25%) than other nationals. Instagram use among Qataris is up considerably from 2013 (34% in 2013 vs. 62% in 2015). Male internet users in Qatar are somewhat more likely to use Facebook than women (52% vs. 42%), and less likely to use Instagram (56% vs. 69%). Qatari nationals primarily use Arabic to access the internet, read newspapers, listen to radio and watch television, which is similar to other nationals in the region. 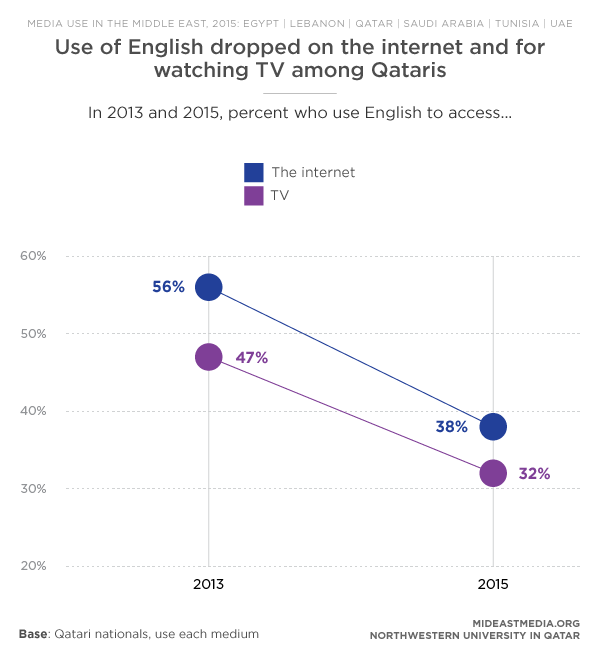 About one in three use English to access the internet and television, a considerable drop since 2013. 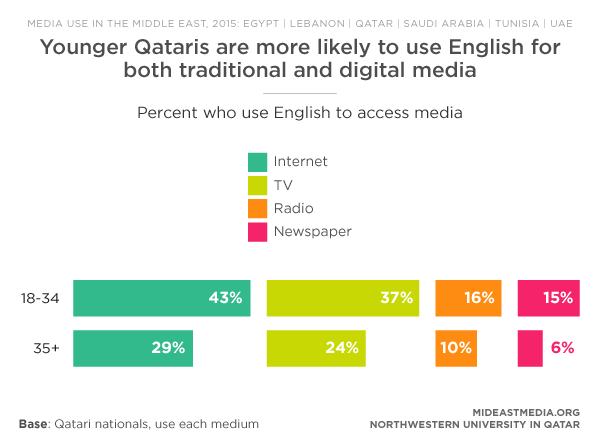 Older Qataris are even less likely than their younger counterparts to use English for both traditional and digital media. When reporting their favorite news organization, only 6% of Qatari nationals say the primary language of the outlet is English. However, this is six times higher than for any other country. Nearly six in ten Qataris say it is OK for people to express their ideas on the internet, even if they are unpopular. This is more than Tunisia and Egypt but consistent with other countries. Fifty-seven percent believe in freedom to criticize powerful institutions on the internet (asked as right to criticize “powerful institutions” in Qatar, phrased as “government” in all other countries). A slight majority believes expressing opinions about public issues is safe, and feel comfortable doing so (53% and 52%, respectively, more than all other countries, though “public issues” was worded as “politics” in all other countries). Qataris are somewhat less comfortable talking about public issues today than in 2013 (59% vs. 52% in 2015). Many Qataris worry about companies (37%) and powerful institutions (41%) checking their online activity. Perhaps consequently, two in three Qataris support tighter internet regulation, higher than all other countries (47%). Notably, both Qataris’ concern about surveillance and their support for internet regulation have increased over the past two years (60% in 2013 vs. 67% in 2015 and 34% in 2013 vs. 41% in 2015, respectively). Qataris’ support for free speech online decreases with age, but comfort expressing personal political opinions increases. Eighteen to 24 year-olds are more likely to support free speech online in theory, but they are less comfortable expressing their own personal views; the opposite is true of 25-34 year-olds. However, despite more comfort expressing their own views, 25-34 year-olds are more concerned about being monitored online by external sources like companies (33% 18-24 vs. 45% 25-34) and powerful institutions (37% 18-24 vs. 51% 25-34). Most Qataris follow national news closely (64%); half (50%) follow regional news and 41% follow international news. Six in ten Qataris say national news media are credible, and 57% say media in Qatar can report the news independently without interference (tied with Saudi Arabia and less than the UAE). Despite respect for their country’s media, Qataris are more likely than others in the region to believe it to be beneficial to consume news from foreign organizations (56% vs. 43%). According to half of Qataris, the quality of news reporting in the Arab world has improved over the past two years, although fewer agree with this statement than did two years ago (59% in 2013 vs. 50% in 2015). Additionally, Qataris are less positive about the quality of news reporting than Saudis or Emiratis. Eight in 10 Qataris (82%) believe the internet is an important source for news/information (up from 67% in 2013). Qataris find information on the internet reliable (45%, compared to 41% in 2013). Seventy percent of Qataris say they are willing to pay for some kind of news content (39% would do so online), much more than all other countries, especially Tunisia (23%).